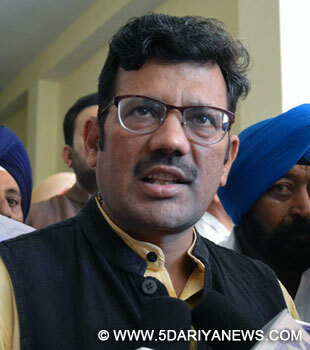 In one of the most vociferous attack on the issue of the "fanatic agenda", being pursued by the Aam Aadmi Party (AAP) in Punjab, the state BJP President Shri Kamal Sharma has launched a scathing attack on the AAP, saying that the posters circulated by the AAP, exhorting people of the state to mark the birth anniversary of Khalistan ideologue Jarnail Singh Bhindranwale, tantamount to anti-national activity. In a strongly worded statement issued from party headquarters in Chandigarh today, Shri Sharma said that the move to mark Bhindranwale birth anniversary is a desperate attempt to destablise the state of Punjab.Strongly condemning the AAP, the state chief of the saffron party, has dared New Delhi Chief Minister Shri Arvind Kejriwal, to categorically clarify on the matter and make it public, before the people of the Punjab, as to whether the AAP supports "Bhindranwale ideology" or not. "Being a border state, Punjab is highly sensitive. Any move to compromise the social fabric and the peace of Punjab to reap political benefits would be extremely dangerous", warned Shri Sharma, while reiterating that Kejriwal owes explanation to the people of the Punjab. Shri Sharma also pointed out that AAP has played a very pro-active role during the Sarbat Khalsa called by the radical outfits in the Punjab in the recent past. He further said that Khalistani supporters and ultra's sitting in foreign countries are openly supporting AAP, which is a matter of "grave concern". He said that the AAP poster, urging people to mark Bhindranwale birth anniversary, has in a way exposed the AAP before the people of Punjab. Ridiculing the AAP for putting the onus on others, claiming that poster was handiwork of the other parties to harm AAP, Shri Sharma said, "It is a typical character of the AAP that whenever the party is under fire, their leaders tries to shift the blame on other political outfits." Shri Sharma argued that if the poster was not released by AAP, why the party remained mum on the issue for so many days. "Why AAP did not disowned the poster and lodged a police complaint", he said, while demanding a categorical reply on the sensitive matter from New Delhi CM Shri Arvind Kejriwal. Continuing his tirade against the AAP, Shri Sharma said that thousands of people had sacrificed their lives in the state, during the black era of terrorism. "BJP is of the firm view that it will not allow anyone to disturb the hard earned peace for fulfilling petty political interests", he said. Shri Sharma said that the several leaders of the AAP have a dubious past and background, adding, "There had been accusations that certain AAP leaders had remained active during terrorism and are still pursuing the radical agenda."